Pics in the Park Returns to Boston Parks! If you are interested in photography, you may be interested in Pics in the Parks! 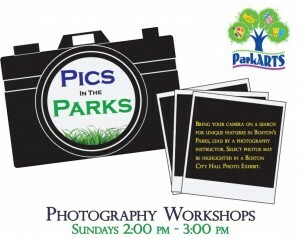 Starting on Sunday, March 8th, their will be free photography workshops at various Boston Parks from 2-3pm on select Sundays. The free workshop is for Photographers of all levels and the sessions be led by a Boston Photographer. For more information or to register, please head here. Thanks, Penny at Boston Zest!